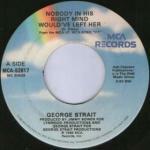 HomeRetro Single ReviewsRetro Single Review: George Strait, "Nobody in His Right Mind Would've Left Her"
Retro Single Review: George Strait, "Nobody in His Right Mind Would've Left Her"
Dean Dillon and George Strait are one of the finest songwriter and singer matches that country music has ever seen. Why do they work so well together? I think it’s because George Strait has that everyman quality, a pure crooner that is as mainstream as it gets. Dillon, on the other hand, is so quirky and offbeat that his material can seem a little out there. Strait is able to close the gap, which makes songs that would sound odd in another singer’s hands sound a bit surprising but still completely natural in Strait’s. Perhaps that’s why he pulls off Jim Lauderdale so well, too. This is a standard country weeper with a mouthful of a title. Dillon took it to #25 in 1980, but Strait took it all the way to #1.